The Museum Permanent Exhibits focus on the natural history of the Santa Cruz region and the Monterey Bay. plants and animals. 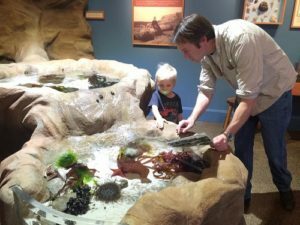 At the Santa Cruz Naturalist Exhibit, meet some of the residents of found along Santa Cruz’s rocky shores while learning more about their lives. Adjacent to the touch pool you’ll find examples of shells found on regional beaches to help you identify your own findings. Examples of typical marine and shore birds are also displayed. 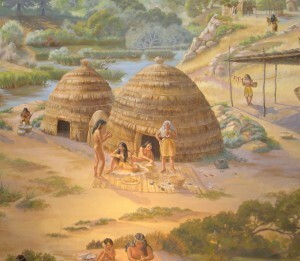 Framed by an enormous mural depicting everyday life in an Ohlone village, the Native Peoples of Santa Cruz exhibit explores life in Santa Cruz prior to the arrival of Europeans. Through the mural and other artifacts, learn how the Ohlone people used and lived with the natural resources found along the Central Coast. Artifacts, baskets and images bring to life the cultural traditions of local native people, both past and present. Examples of native basketry, beadwork and stone implements can be found throughout the exhibit. Real mortar and pestles are available for young and old to try their hand at grinding acorns. Acorns were an important food source for the Ohlone people prior to the Mission period. The Ohlone were semi-nomadic, therefore little remains of their villages, tools and art. This museum is one of the few places where you can see artifacts from this important local group. Interested in learning about Ohlone life during the Mission period? Check out the Mission Santa Cruz. The far end of the Museum hosts many exhibits representing the ecosystems and native animal life of the Santa Cruz region. Visit the live honeybee display, giving you a peek at the inside of a working hive. 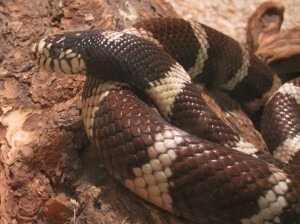 A beautiful live “chocolate phase” king snake gives you a close-up view of a typical resident of the coastal California region. Look above for a view of a golden eagle, and don’t miss our coyote pair.